Finally, after a long days worth of traveling we made it into the beautiful city of Marrakesh. Much too exhausted to really do much of anything, we found a nice hotel. Which, reminds me. Allow me to go off on a bunny trail for a moment. Hotels in Morocco vary a lot. There are western style hotels, and Moroccan style hotels. Moroccan style hotels usually do not have air conditioner. Your bathroom, if you have one, is usually a squat potty with a shower head somewhere that barely works. Your beds will be hard, itchy blankets, and some lovely crawling roommates. I’ve stayed in two Moroccan style hotels thus far, (one of which actually had a mini air conditioning unit, which cost an arm and a leg extra) and while It was a bit of a shock at first, I did enjoy those experiences. When I was at the waterfalls our hotel was as described with no air conditioner. I ended up sleeping on the dirty floor to keep myself cool. But even with that tid-bit, I still loved it. Waking up to the sound of sheep, horses and goats was just lovely..and the faint smell of running natural water. Staying in places like that has its perks, if you’re adventurous, don’t mind being a little dirty and can live in heat, I suggest doing it. It’s really worth it. But, it’s not for everyone. I really love the breakfasts you get in Moroccan hotels. It’s always olives, bread, jam, juice and sometimes cheese and a lot of tea. It’s a small, simple breakfast but there’s something so authentic about it. These kinds of hotels range roughly from 5-15USD a night per person. Dirty cheap if you know what I mean. out of the bunny trail, and back on topic. We found a nice western-style hotel to crash in. Ugh. Perfect air conditioner and a clean soft bed; I did enjoy that bit of luxury! As we were approaching this Western-style hotel I did complain a bit, as some part of me wanted something more authentic at the time. But my friend insisted, through his exhaustion, that we grab the first thing we see. I’m glad he ignored my suggestion, a good nights sleep was amazing. Getting to bed late, we slept through the day (intentional, as it gets over 120F during the day in this part of Morocco) We ate at Mcdonalds – as it was Ramadan and everything else was closed – then slept more of the day away, and finally come night-fall when everything cooled down we headed off to Jemaa el-Fnaa, the busiest square in Africa. Immediately upon entrance into Jemma, within a matter of seconds, or minutes I have no idea, we are attacked by snake charmers and henna artists. All in a matter of seconds a woman forces my hand down and draws a lame flower on my hand with henna, a man takes my friends away and forces snakes of their heads, another man places a cobra on my feet and a water snake on my head, the henna lady runs off away from the snakes in fear (with another snake following behind her, hilarious) finally someone takes my friends phone and takes a photo with it, and then money demands. The henna lady returns and demands money for her “work” which she forced on my hand, and the snake charmers demand money for the photos. And it wasn’t reasonable, they demanded a stupid amount of durham. 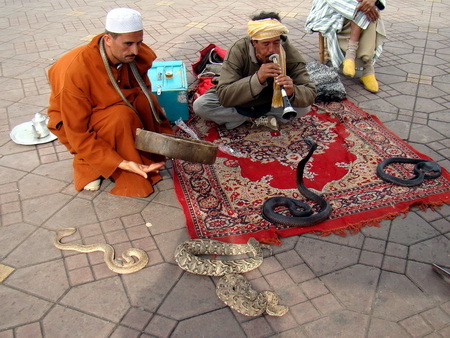 (moroccan $$) We gave them small change, and ran away, with a snake charmer and a henna lady chasing close behind, until finally we lost them. A similar incident happened a few hours later but with monkeys. I had a monkey in a diaper on my shoulder….I was willing to pay the guy a decent amount for photos, which my friend took. The pictures were so horrible I deleted them. (For god knows what reason he chose the moment I had one eye open, one closed, and laughing. I LOOKED like the monkey.) Luckily I didn’t have to pay because he demanded a stupid amount of money as well, and a local over heard his barbaric request and punched him in the chest and told us to leave..which we did, without a problem. After that I was unable to take any photos of the area, because every time I stopped to take one, or so much as look at a cobra, I was charged. I never paid though, but running away became not only exhausting but annoying as well. The following day we took a great trip to a medieval fortress. I explored holes, tunnels, old jail cells, dungeons and tombs. It was fantastic and completely other worldly to be in a dungeon. Frankly, I didn’t want to leave..which I guess is sort of ironic. after the dungeon we took a short train ride to Casablanca and got a good look at the third biggest mosque in the world; it was absolutely beautiful! Upon return home we ran into some train problems. We got on the wrong train and ended up god-knows where. There was a lady cooking, and we ended up stopping at a little place for a few drinks to get our heads straight. Finally we figured it out and ended up back in Rabat much later than we had hoped. I only have a few more weekends here in Morocco, and even with that in mind I don’t know how many more trips I’ll be taking, if any. I’m running low on money, so chances are I’ll do one more trip. I’m praying, praying praying to see Tangier, Morocco and explore the caves located on the ocean. I think, no matter what (even if I must go alone) i’m going to go see them. I’m in Africa, after-all, that’s something high on my list of must-sees and I am going to see them! “This…this is my element” I thought as I lead my group of friends on pure instinct. 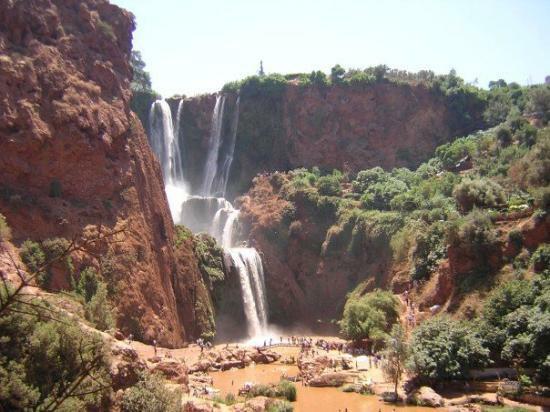 We had arrived shortly before to the amazing Cascades d’Ouzoud in Morocco, located within a small village about as far out in the mountains and you can get. One of my friends, who organized the trip, found our hotel which is located on the top of the village, so we take many flights of stairs outside to get to the bottom of the waterfall area. 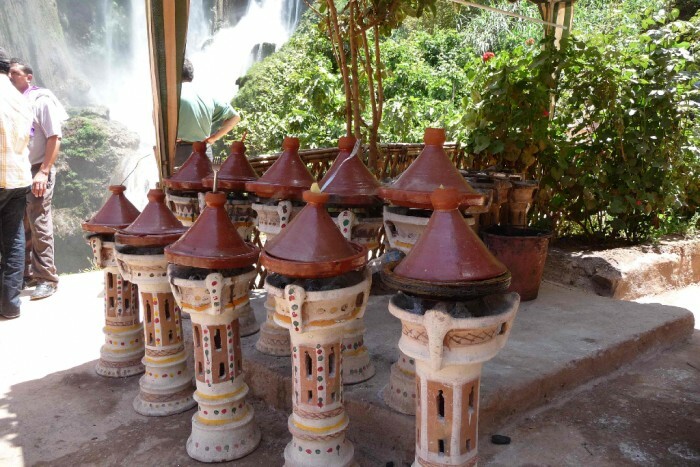 as you walk down stairs there are abundant amounts of outdoor traditional Moroccan and Berber cafes and shops. It’s amazing to see, and there is always live traditional music everywhere you go. Once you hit the bottom it’s a tourist hot spot. 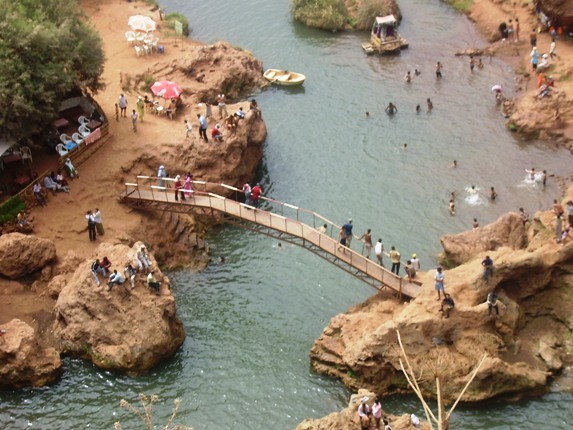 Picture taking areas, donkey rides, boat rides around the water falls and henna tattoo stands,bustling with energy and people. I instantly wanted to get away from the commotion. I just sensed, somewhere among the waterfalls and mountains there would be a secluded place for me to experience this beauty. I convinced my very reluctant group of friends to allow me to lead this one. skeptical, they agreed as I set off hoping from rock to rock, climbing hills, crossing bridges and small streams, and climbing rocks, barefoot and free, as my friends did the same themselves. Until finally, over a hill, I found an area that screamed for me to enter within. My friends were still reluctant to follow me for some reason. “I’m sure there’s a reason no one is out here Danni…we should head back the other way. we’ve gone far enough” Eventually I did manage to get them to at least allow me to run ahead and scout before we all made our way through, just in case. Over a small rocky hill within the mountain side was a clearing that then turned into a well shaded area of tunnels made by trees. I followed this tunnel of trees to find an old, large mat sitting in the shade. “Now..if there is a place to swim near by…this spot would be ideal” i thought to myself as I continued through the tunnel of trees. I again popped out to a clearing, and to my left, filled with amaze and astonishment was another waterfall. To the right, was a perfect swimming area. I hopped from rock to rock to make it to this swimming area, and climbed down a hill to find a lovely “beach”,stream and frigid water along the mountain side and water falls. Noticing a beautiful water snake scurry into the water, and the extreme lack of human life within the area, I rushed back to tell my friends that this was it. They, again,didn’t believe me. Reluctant as always, finally followed me as I lead them through the tunnel of trees, over the hills and rocks and as the clearing welcomed the sights I described, they finally said “we doubted you. but you did it”. They all said. I guess for once I managed something right. Myself and a few others swam for some time in the water falls (others convinced the water was too dangerous..too bad because the experience was so worth it) It was a fantastic, beautiful experience. Reacting on my instinct, exploring, climbing and running..I felt myself in a element of complete bliss..a somewhat..nostalgic bliss. I even forgot to take photos of the area. Nothing else mattered except getting to where my heart called for me to go. Some of my friends did get some pictures, which I will upload asap, they are amazing for taking these photos! I also hope to go back again tomorrow..fingers crossed.